The centre opened its doors on the first of November, 2007 and was one of the largest regional shopping centre developments outside of the capital at the time. With more than 185,000 square feet of retail space and major international retailers on board, the Athlone Towncentre Shopping Centre changed the face of retail in the midlands irrevocably. The air of excitement surrounding the arrival of retailers including Marks & Spencer, Zara, River Island and H&M was palpable on that chilly November morning in 2007, as the centre opened its doors to the thousands of eager shoppers keen to experience what the new shopping centre had to offer. Fast forward 10 quick years, with the worst recession in living memory thrown in for good measure, and Athlone Towncentre has established itself as a popular retail destination for shoppers across the Midlands and further afield. “The fact that we offer major fashion brands including Zara, H&M, M&S, River Island all under one roof and all conveniently located just off the M6 is a major draw for the centre,” according to centre manager, Shirley Delahunt. A testament to the success of Athlone Towncentre is the fact that the centre has succeeded in attracting additional international brand names in recent times, such as TK Maxx, Starbucks and Skechers. This year to date, there have been a number of new store openings, including Inglot, Vila and Selected, which has seen the retail occupancy within the centre rise to almost 100 per cent. “It’s absolutely true to say that the first number of years were difficult for the centre with the country in recession, but we worked really hard throughout this period to provide customers with the best value and best customer experience possible and as the economy has improved, the centre has really established itself amongst shoppers in midlands,” Ms Delahunt continued. 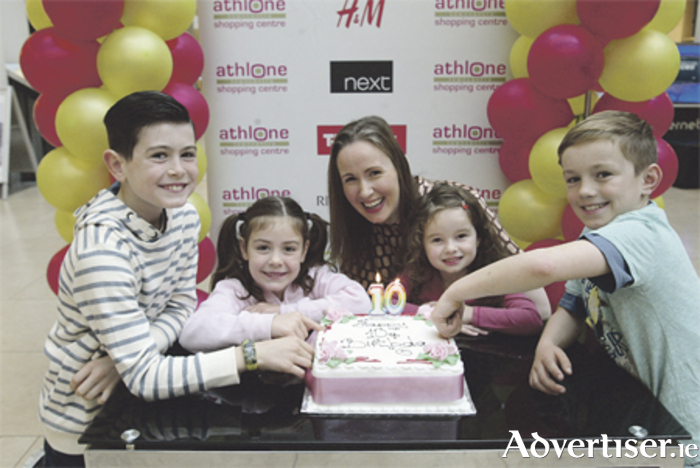 Athlone Towncentre celebrates its tenth birthday with an activity packed programme from November 1 to 5. This includes a winter style showcase hosted by Doireann Garrihy on Saturday, November 4, and a birthday bash on Sunday, November 5, from 2pm to 5pm. As part of the celebrations, there is also a ‘Five Grand Giveaway’ currently running in centre, with customers having an opportunity to register as one of the 10 lucky finalists to participate in the grand finale on Saturday, November 4, at 2pm. On the day there will also be one additional wild card finalist selected to participate.